For many of us, December 21, marks this year’s Winter Solstice. But for plenty of others, it’s also the Summer Solstice. How can this be? What is actually unique about today from an astronomical sense? What is a solstice anyhow? A solstice occurs on the day when the planet’s hemisphere has its maximum (or minimum) amount of solar exposure (in December, it’s the northern; in June it’s the southern’s turn), which in turn gives us the longest and shortest days of the year. Contrast that to the equinoctes (yes, that really is the plural form of equinox), in which the length of day is equal to the length of night. Now, you might have heard the solstices being referred to as the “First Day of Spring/Winter”, which if you live in a geographic area that has noticeable seasons you know this isn’t true. It would be more appropriate to consider a solstice as the middle of a season. 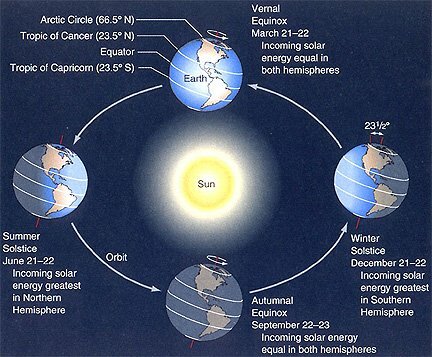 Starting today, the daylight hours get longer in the northern hemisphere and shorter in the southern. So where did the “First Day of Spring/Winter” idea come from? If you find out, please let me know.